Now that the weather is turning hot and humid, it’s best to keep your hair up and out of your face. 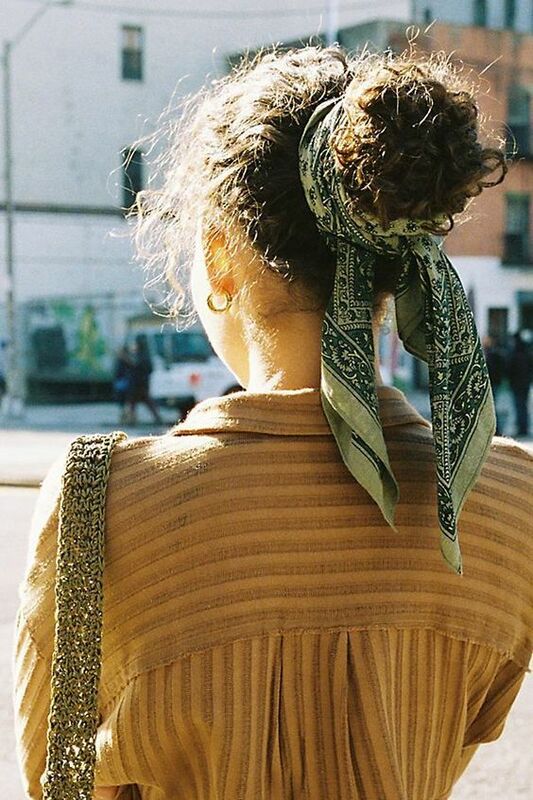 Give your styling tools the season off and try one of our 6 simple hair scarf styles instead. No matter the length of your hair, our favorite looks are sure to become one of your summer beauty staples. All of the styles we chose are super simple and can be tied in a matter of minutes. For example, a hair scarf headband is created in three simple steps. Place the scarf at the back of your neck and then cross the two ends at the front. Pull the ends back towards your neck again and tuck them in. Done and done! 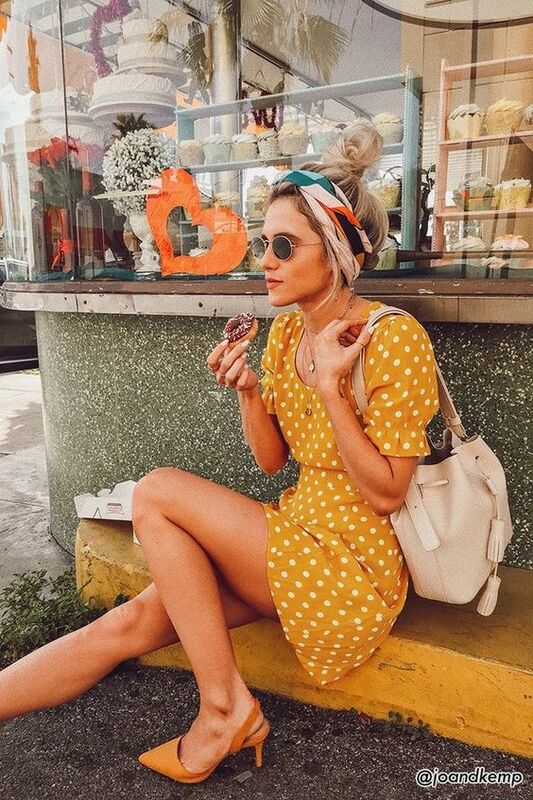 This look is super cute with a messy bun and instantly pulls your look together. Prints don’t need to match either, a soft graphic scarf like this Blue Horizon Multi Silk Scarf from Madewell works just fine with this season’s polka dot trend. Whether your hair is long or short, you can still rock a scarf with a ponytail. We love the effect of a long skinny scarf and a cute mini ponytail. Make sure the ends stay between the middle of your back and your waistline for the best look. Let the ends go loose and keep it super causal. A colorful scarf is a nice way to add some pop to a monochromatic minimal outfit for sure. Don’t want color? Try this white skinny scarf from Paige Denim. It’s made from 100% silk Georgette and works equally well as a neck scarf. Accessories that can do double-duty are always welcome in our closets. 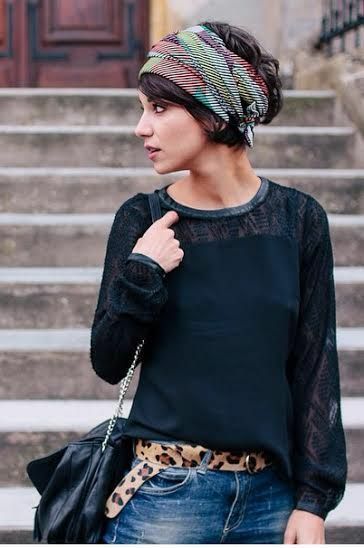 Another great look with short hair is the front tie turban. Take a long hair scarf and wrap it around your head twice, making sure the ends overlap in staggered layers. Instead of tucking in the ends, tie them into a little knot at the base of your neck. So cute with a little bit of bangs and some waves. In fact, Free People has a Vintage Silk Scarf that is the perfect length for triple wrapping (55.5 in.). We love that each tie features a unique mixed print design so yours is always one-of-a-kind. If you want a more-in depth guide to tying turbans, our head scarf article from last Spring will give you some extra help. For a medium length scarf, a single knot will upgrade your look in 6 seconds flat! A silk floral scarf that is around 35×35 inches square is the perfect size for this hair style. 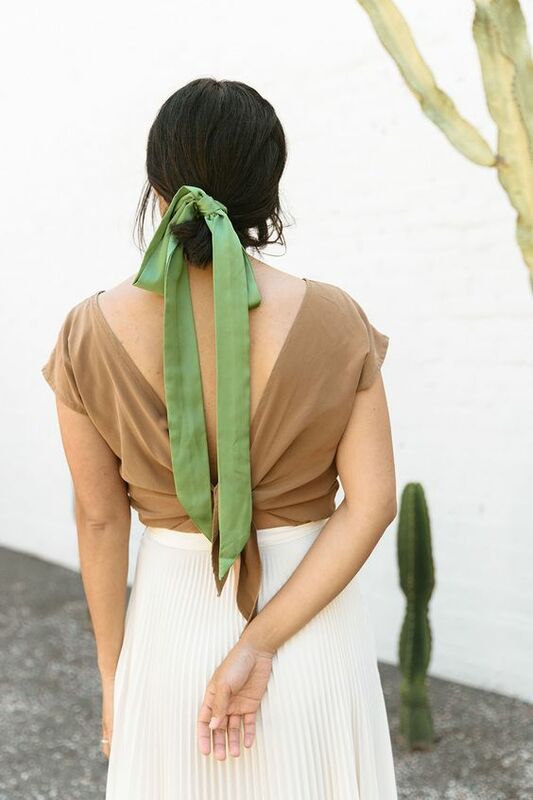 Use a regular tie to secure your ponytail in place and tie a hair scarf over the knot. This also looks beautiful with half of your hair up and the other half down. Totally French girl chic. Just add one of our favorite straw purses and head off to le marché! Feeling bold and beautiful? 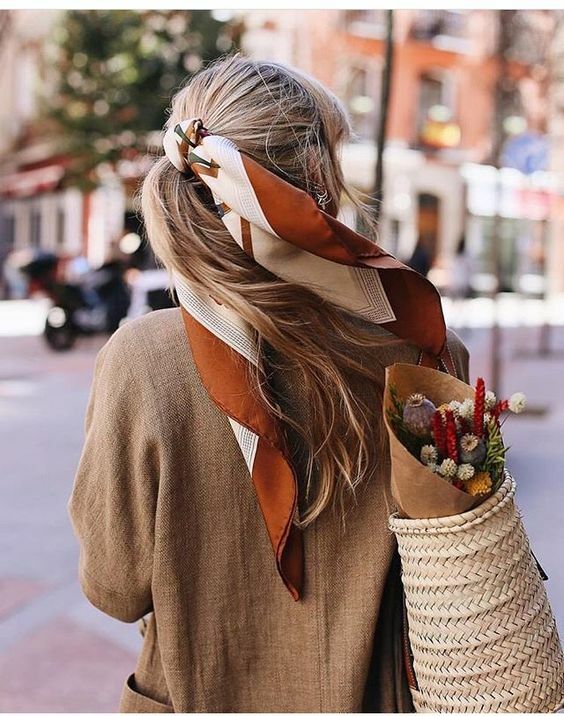 If you’ve got a lot of confidence, then a front tie hair scarf and a messy updo is the way to take your style to the next level. Simply wrap a wide scarf around your head and tie the ends into a super cute bow. This extra large silky square scarf (34×34) is the perfect size and the Purple Multi color is to die for! Add a pair of sunglasses that fits your self-labeling and no one will ever think “walk of shame”! For long hair, a bun can also get a little extra pizzazz from a long silk scarf. Use bobby pins to secure your bun in place and then wrap a hair scarf twice and tie underneath. Leaving the ends a little shorter give the hairstyle less fuss and lets the bun do most of the talking. Bandanas look great too, be sure to check out our bandana article for more inspiration. Can’t decide on a color? 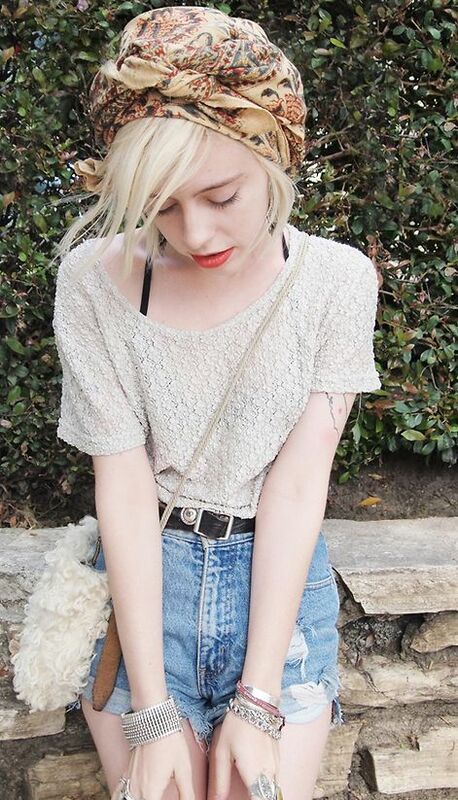 Try Urban Outfitter’s Multicolored Bandana in soft cotton for a vintage feel. You can pick which ends go free for multiple looks in one. All you need is one or two scarves in the lengths you wear most. If you keep a hair scarf on hand, you will always look a little #extra whenever your hair is up. We recommend packing one in your travel bag or tying one to the handle of a purse. Bad hair days are officially a thing of the past! That turban look is great! I have pretty short hair and am getting tired of ponytails. Thanks for the ideas! Yes, I really like the turbans too and adding a scarf to a ponytail. I have some from my grandmother that I will have to pull out of hiding!